1.) He puts salt on his carrots. 2.) He eats Crunchy Corn Bran for breakfast. 3.) He makes Hole-in-One Eggs for breakfast on “special” days. You know what though? After about a year I realized I love salty carrots, Crunchy Corn Bran is the bomb and I adore Hole-in-One eggs — especially when he makes them for me. I decided to carry on the Hole-in-One Egg tradition with our kiddos this Valentine’s Day. 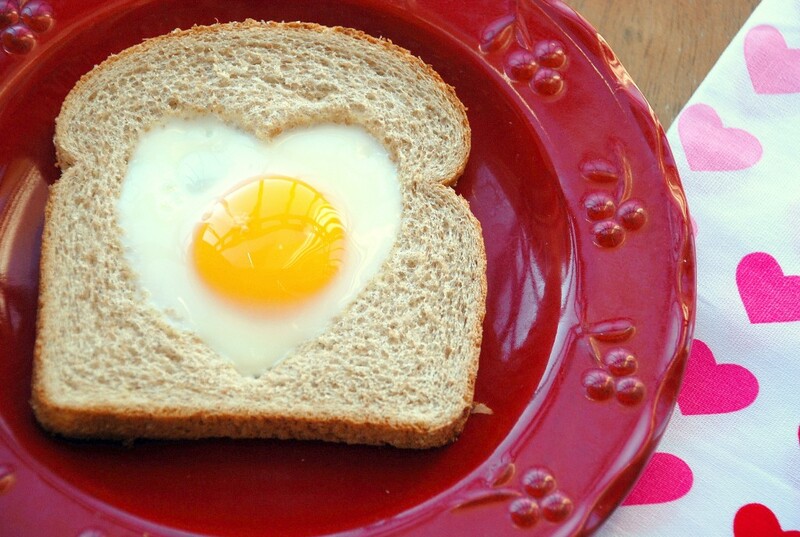 Instead of a round “hole” I cut out a heart-shaped version and cooked the egg right inside. The result is an adorable, healthy breakfast that’s full of well, heart. 2. Melt a teaspoon of butter in a nonstick skillet over medium heat. 3. Add the toast and crack an egg right inside it. 4. Cook to desired level of doneness. If you flip the toast, it doesn't look as pretty -- but it's necessary if you don't like your eggs overeasy. We love 'em runny, so I just turn the heat down to medium-low and put a lid over the top 'til the egg white cooks through. 5. Sprinkle with salt and pepper, to taste. Eat right away.